What’s the Difference with All on 4 Implants in North Dallas? Despite the latest advancements in dentistry, tooth loss is still a prevalent problem with roughly 36 million adults in the Unites States missing all their natural teeth. In the past, your options were limited to replace them, but now you have several solutions at your fingertips. Among the most popular option involves dental implants; however, those with complete tooth loss are often hesitant to choose them because it is believed that each tooth must be replaced individually. However, this is not the case. With All on 4 implants in North Dallas, only four implant posts are needed to complete your smile. A traditional dental implant consists of three main parts: an implant post, an abutment, and a dental crown. Together, they replace the root and crown of a single tooth. This is an effective solution if you only have one that needs to be replaced. However, if you are missing an entire arch, this would be too many implant posts to use. As a result, All on 4 was created. All on 4 is similar to traditional dentures to a certain extent. A gum-colored base features the prosthetic teeth. However, you will not need a denture adhesive to hold it in place. Instead, four dental implant posts are used to anchor it to the jawbone. This resolves the complications of traditional dentures, like slipping and irritation without having to use several posts to replace your teeth. The posts used to replace an entire are like those used with a single tooth unit; however, there are some slight differences in their placement. They are placed at an angle to allow them to be inserted into the thickest areas of the jawbone where there is the greatest bone density. A traditional implant uses an abutment to connect the dental crown to post. With All on 4, a ball or socket connector piece is used, which helps to stabilize the arch so you can eat, speak, and smile with confidence. 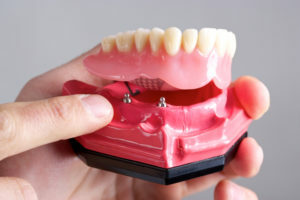 The denture is fitted with a metal undercarriage which attaches to the custom abutments. After the posts are placed, you are given a temporary set of dentures while you heal. You will not have to walk out of the office with an incomplete smile like that of traditional dental implants in North Dallas. Once you have fully healed in about six to eight months, you will be given your permanent arch to fully complete your smile. Stop living with the irritation of traditional dentures. Replace your missing teeth with All on 4 Today. Since 1977, Dr. Dale W. Greer has provided high-quality dental services as a graduate of the Baylor College of Dentistry. Through advanced training and extensive qualifications, he offers superior services to meet a wide range of needs. As “One of the Best Dentists in Dallas,” he offers dental implants to treat tooth loss. If you have questions about All on 4, contact our office today to schedule a consultation with Dr. Greer. Comments Off on What’s the Difference with All on 4 Implants in North Dallas?